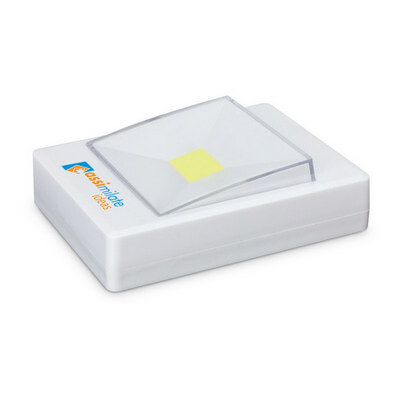 Powerful battery operated light for illuminating places that do not have lighting or a regular power supply. It has a strong adhesive pad on the back for securing it in place and is ideal for cupboards, wardrobes, outside sheds, huts, horse floats or any place that needs light. Beacon uses radical COB (Chips on Board) technology to produce much more light intensity than conventional lights but draws a lot less current which dramatically increases battery life. Multiple LED diode chips are bonded directly to a circuit board (which is usually yellow) to form an incredibly bright light module. It uses four AAA batteries which are included. Colours: White. Dimension: 100mm x 80mm x 30mm. Print Description: Switch- 10mm x 40mm (top or bottom). Print Type: Pad Print. Packing: Individual box. Price includes : 1 Col 1 Pos Print. Setup is included.